Known as the couture company in the residential interior design industry, Innovative Creations specializes in unique and extraordinary turnkey interiors for exclusive residences and yachts. With a sharp eye for details and an unparalleled passion for creativity, our design team will unveil your taste from Mediterranean, Italian Venetian, Moroccan, Contemporary, Transitional, and beyond. 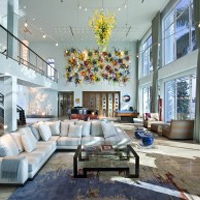 Innovative Creations has worked with Internationally renown artists in the creation of works of art which also become some of the largest private installations of one of a kind art in a private residential setting. Innovative Creations has been involved in the marine business for decades in different capacaties. 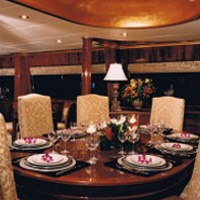 Whether it will be an “interior design and furniture layout project” or actually “cutting a yacht in half and extending it several feet”, Innovative Creations is able to put together the most professional teams to achieve the sought after results on time and budget. Project Management and Planning, New Construction, Addition and Remodeling are also services offered by Innovative Creations through a collaboration with architects, construction companies, and general contractors. 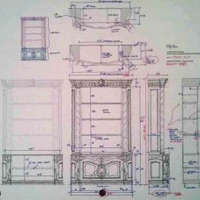 Currently, Katia is working on several projects spanning from the USA to Italy and she is designing a line of custom home furnishings sold exclusively through innovative creations. The “Dilemma” in Italian, dilemma means not sure, uncertainty, and not positively sure of what to do or how to handle a situation. Dilemma is multi-faceted as well as transitional. The glass shown is a light blue color, but the client need not be limited to that. 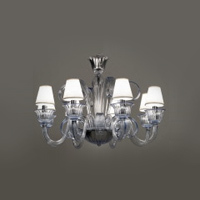 Additional sizes, colors and matching sconces are also available upon request. “Piano Nobile” in Italian, meaning, “noble floor” or “noble level”, the principal floor of a large house, is usually built in one of the styles of classical renaissance architecture and is often the second story. The Piano Nobile features intricate and detailed accents such as custom-blown floral shapes and leaves and hanging beads as extensions of the multi-tiered arms of this grand chandelier. To incorporate a contemporary transitional flare to the furnishing, the Piano Nobile is available in white in addition to other custom colors and sizes. Both home custom Murano Glass chandeliers are entirely handmade and hand blown on the island of Murano, Italy, which is located just a few miles from Venice. Prices are available upon request sold exclusively through Katia’s design firm, Innovative Creations. For more information please call (954) 565-4333 or ICI@InnovativeCreationsusa.com.